"Oberlin changed my life," says Bi-Khim Hsiao from her 29th-floor Hilton Towers hotel room in New York City, where she's spent the last few days schmoozing with political dignitaries. Six years after graduating, she's reminiscing about college in a hotel that broadcasts CNN in its elevators. "When I was growing up in Taiwan, it wasn't a very democratic place," says Hsiao, who moved to New Jersey while in high school. "Later I worked in the East Asian Collection in the Oberlin library and started reading books written by dissidents or democracy activists. The librarian was Taiwanese and brought in material that was previously banned in Taiwan. That's when I found out I'd been cheated all my life." Convinced by Annette Lu, founder of Taiwan's modern feminist movement, to join the Taiwan Coalition for Democracy during her junior year, Hsiao put her newfound knowledge to work. 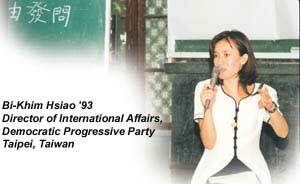 Later, while pursuing a PhD in political science at Columbia, Hsiao was recruited to set up the Democratic Progressive Party's (DPP) office inWashington, D.C. Last year, she was promoted to director of international affairs. Hsiao speaks of the leaders of Taiwan's democratic movement with reverence and awe. Lu, she explains, was imprisoned for speaking out at a human rights rally, and former DPP president Shih Ming-Te, considered the Nelson Mandela of Taiwan, was jailed for 25 years. Today, the party faces threats of political dominance from China. "Although there's a tragic past for the party, most of our leaders have put that aside and call for forward-looking agendas," says Hsiao. "They also make the attempt to recruit young people and give them positions of responsibility." Hsiao isn't intimidated by her status as the youngest department head in DPP history. "Young people tend to be more energetic and creative. We are not burdened by a stubborn ideological orientation, so we can be more flexible in finding solutions to problems." Take DDP's recent electoral campaign: to attract younger Taiwanese citizens, party officials traveled to popular outdoor areas and blended rock music with political speeches. Hsiao remains steadfast to her goals and her Oberlin beginnings. "I come from an Oberlin grassroots mentality and find myself in the high life--meeting with ministers, going to state dinners, staying at five-star hotels," says Hsiao. "There are temptations in the political world, and I respect the senior leaders in our party who have come out of all these years untouched, with the same perspectives. "Oberlin is a place where you can comfortably criticize everything. The atmosphere encourages that. When you leave, you try not to lose your ultimate ideals, even when compromising on smaller matters. That's the greatest challenge."